Modern vehicles, scratch that, even cars from the beginning of the 20th century, are complex machines that require meticulous care in order to operate properly. However, newer cars are full of computer equipment that monitor every corner and bump you take. But the mechanical pieces of your car, the engine, transmission, radiator, brakes and so forth actually get you where you're going, and the suspension system is no different. The suspension system serves a major role in comfort and safety during your commute. The suspension system keeps all four wheels on the ground while driving around corners or maneuvering down bumpy roads. 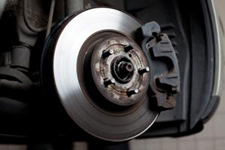 Because your braking power is distributed over each wheel it is imperative they stay connected to the road in order to provide the maximum braking power. The suspension system shifts the center of gravity of the car, truck or SUV during cornering. This is done by the anti-sway bar and shock absorbers. The anti-sway counteracts up and down movements of the other side of the vehicle in order to reduce roll. As suspected, the main function of the suspension system is to absorb the shock of uneven road surfaces to give you a smooth ride. If your vehicle seems seems be a little stiff and is giving you a more bumpy ride then it use to it may be time to repair your suspension! If you're cruising down the road and you can feel every bump, crack and sewer in your path then there is likely an issue with your leaf springs, shocks, springs or other suspension part. For expert suspension repair in Covina contact Hye-Tech Auto. The professional mechanics at our Covina auto repair shop can repair any suspension problem, as well as conduct brake repair, engine repair, transmission repair and service other vehicle systems. Call Hye-Tech at (626) 332-5452 today to make an appointment for quality auto repair in Covina!